NEW: Sen. Barack Obama to voters: "Change has come to America"
(CNN) -- Barack Obama told supporters that "change has come to America" as he claimed victory in a historic presidential election. Sen. Barack Obama addresses a crowd of 125,000 people in Chicago, Illinois. "The road ahead will be long. Our climb will be steep. We may not get there in one year or even one term, but America -- I have never been more hopeful than I am tonight that we will get there. I promise you -- we as a people will get there," Obama said in Chicago, Illinois, before an estimated crowd of up to 240,000 people. Flanked by American flags, Obama told the roaring crowd, "This is your victory." Supporters in Chicago cheering, "Yes, we can" were met with cries of "Yes, we did." More than 1,000 people gathered outside of the White House, chanting "Obama, Obama!" "This was a long and hard fought campaign but the result was well worth the wait. Together, under the leadership of President Barack Obama, Vice President Joe Biden and a Democratic Congress, we will chart a better course to build a new economy and rebuild our leadership in the world." Tuesday marks the end of the longest presidential campaign season in U.S. history -- 21 months. Obama, 47, will now begin his transition to the White House. 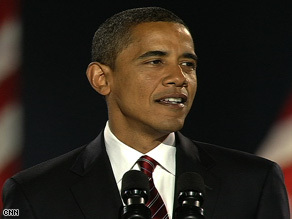 He will be sworn in at the 44th president on January 20, 2009.